Successful ‘business mum’ is seeking 5 working partners to work part-time from home, alongside and without compromising family commitments or current career. 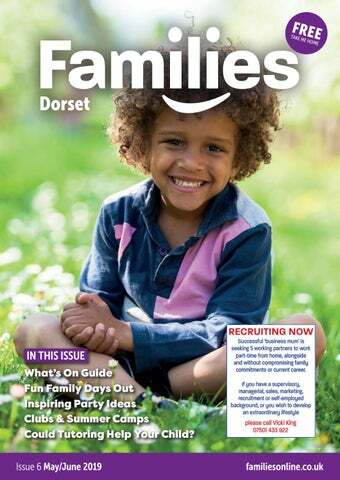 Editor’s Welcome Managing Editor - Keren Moseley editor@familiesdorset.co.uk 07518 514012 Advertising - Claire Clarricoates Claire.clarricoates@familiespublishing.co.uk 07812 218331 Design - Matthew Craig mattcraigdesign.co.uk Next Issue July/August 2019 Summer Activities & Days Out, Summer Clubs & Camps, Education and much more! Booking Deadline: 31 May Copy Deadline: 6 June Distribution We distribute throughout Dorset including Bournemouth, Blandford Forum, Broadstone, Bridport, Christchurch, Dorchester, Ferndown, New Milton, Poole, Ringwood, Swanage, Verwood, Wareham, Wimborne and more. Find Families Dorset Magazine on @FamiliesDorsetMag @FamDorsetMag © Families Dorset Magazine May/June 2019. Families Dorset is part of Families Print Ltd, a franchise company. All franchised magazines in the group are independently owned and operated under licence. 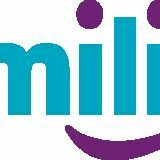 Families is a registered trademark of LCMB Ltd, Remenham House, Regatta Place, Marlow Road, Bourne End, Bucks SL8 5TD. The contents of Families Dorset are fully protected by copyright and none of the editorial or photographic matter may be reproduced in any form without prior consent of Families Dorset. Every care is taken in the preparation of this magazine, but Families Dorset, its distributors, the franchise company, Families Print Ltd, and LCMB Ltd cannot be held responsible for the claims of advertisers nor for the accuracy of the contents, or any consequence thereof. In This Issue 4	News & Views 5	Why Parents are Turning to Tutoring 6	Party Ideas to Inspire You 8	Holiday Camps & Courses Guide 10	Help Your Children Make Friends 11	Family Fun Days Out 14	What’s On Guide Would you like to advertise your business to over 40,000 parents in our July/August issue? With summer just around the corner, thoughts invariably turn to planning for the long summer break and perhaps even a family get away. So, make sure you check out our top tips for Clubs and Holiday Camps, and be inspired by some great family get-away deals at one of Dorset’s best camping sites, Old Bidlake Farm, and more. If you have any news or events that you’d like to share with our readers, or if you’re a local business – attractions, holiday clubs, leisure and education providers, nurseries, play centres - and you’d like to reach parents and families in our next issue – please do get in touch with me. We also highlight some of the best family days out - including special offers from Kingston Maurward Animal Park & Gardens and Highcliffe Castle - and give you the low-down of things to do near you in our indispensable What’s On guide. Plus, find out why so many parents are turning to tutoring and discover what’s trending in the world of children’s parties on page 6. It’s Official! You REALLY like us! 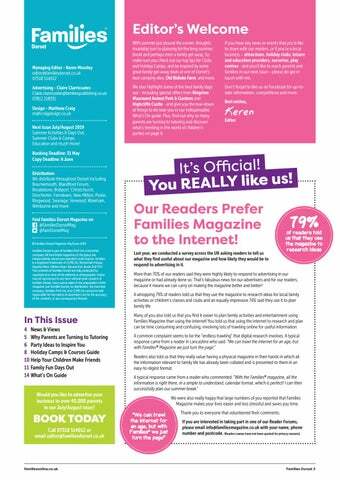 Our Readers Prefer Families Magazine to the Internet! Last year, we conducted a survey across the UK asking readers to tell us what they find useful about our magazine and how likely they would be to respond to advertising in it. More than 70% of our readers said they were highly likely to respond to advertising in our magazine or had already done so. That’s fabulous news for our advertisers and for our readers, because it means we can carry on making the magazine better and better! A whopping 79% of readers told us that they use the magazine to research ideas for local family activities or children’s classes and clubs and an equally impressive 74% said they use it to plan family life. Many of you also told us that you find it easier to plan family activities and entertainment using Families Magazine than using the internet! You told us that using the internet to research and plan can be time consuming and confusing, involving lots of trawling online for useful information. A common complaint seems to be the “endless trawling” that digital research involves. A typical response came from a reader in Lancashire who said: “We can trawl the internet for an age, but with Families® Magazine we just turn the page.” Readers also told us that they really value having a physical magazine in their hands in which all the information relevant to family life has already been collated and is presented to them in an easy-to-digest format. 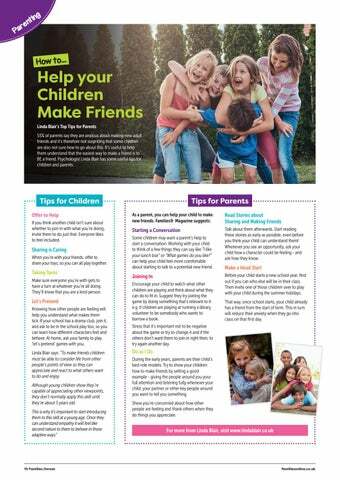 A typical response came from a reader who commented: “With the Families® magazine, all the information is right there, in a simple to understand, calendar format, which is perfect! I can then successfully plan our summer break.” We were also really happy that large numbers of you reported that Families Magazine makes your lives easier and less stressful and saves you time. Thank you to everyone that volunteered their comments. If you are interested in taking part in one of our Reader Forums, please email info@familiesmagazine.co.uk with your name, phone number and postcode. (Readers names have not been quoted for privacy reasons). Summer in the Alps The Alps may be an obvious destination for the ski season, but how about a summer visit? Summer offers enough green (the mountains) and blue (the sky) to set you up for the whole year - and plenty of fresh air to fill your families’ lungs. entertained. The research revealed that most parents expect to spend £178.29 during a halfterm holiday. 4 out of 5 parents agree that school holidays are getting more expensive every year, with more than 76% saying there are fewer free entertainment options out of term time, compared to five years ago. For ideas of things to do during the holidays for budgets of all sizes, check out our Clubs & Holiday Camps pages and What’s On Guide. previous childcare voucher system, which closed to new entrants from October 2018. Ongoing technical difficulties, the complexity of the system and low awareness have been attributed as causes for the poor response by families. The government has said it is running a national communications campaign to raise awareness and encourage more parents to apply. by schools inspectorate Ofsted, with Glenmoor recording a P8 score of 1.03 and Winton a P8 of 0.6 for 2018, meaning pupils are making above average progress and a negative score means below average. At the centre of the whole-school approach taken by Thinking Schools is the use of a ‘thinking language’ in each subject by every teacher and every pupil. They use visual tools that help transform information into knowledge. This leads to deeper learning and the development of higher-order thinking skills, such as analysing, evaluating and creating. Safety Wristbands Easy2name’s new safety wristbands will help you find your child if they wander off on a day out and can also be used as medical alert. Contact details such as a mobile number and important medical information can be written on the outside. Or you can use the internationally recognised term ‘ICE’ (In Case of Emergency) on your wristband. These silicone wristbands are waterproof and tear proof and are ideal for outings, school trips and family holidays. Suggested children’s sizes are 14cm for ages 2-4, 16cm for ages 5-8 and 18cm for ages 9 and above. Why are Parents Turning to Tutoring? Around a quarter of children in the UK are being tutored. Claire Winter looks at why one in four families are seeking extra help outside of the classroom. Parents often get extra tuition for their children to prepare them for important exams. They also get them to help boost their child’s skills in a subject in which they aren’t doing well or to help them excel in a subject, and impress the schools to which they are applying. It’s estimated that we spend £2 billion a year on private tutoring, which makes us one of the top spenders on tuition in the world. Ex-teacher Victoria Kennedy, takes the view that tutoring needs careful management to ensure it doesn’t result have a negative impact on a child. She says: I found that children with extra pressure and expectations from parents struggled with failure, needed more encouragement and guidance to complete tasks and often suffered from a sense of overwhelm. Many parents believe that tutoring The education charity the Sutton can be an amazing resource that Trust acknowledges the importance gives children extra confidence, of tutoring but worries that extra reassurance and skills to stop them tuition is causing the educational feeling overwhelmed by the gap to widen between pressures of schoolwork. children from affluent Others argue that extra Many parents economic backgrounds believe that tutoring creates more and those from poorer tutoring can pressure on children. Many ones. be an amazing children are busy already resource. with lots of extra-curricular activities and homework. The charity’s chair, Sir Peter Lampl, says: Private tuition is widespread and increasingly so. Nearly half of teachers have tutored and a quarter of teenagers have been tutored. Families® Magazine spoke to parents about their thoughts on tutoring. CEO and founder of the charity, Action Tutoring, Susannah Hardyman, also highlights the importance of tutoring. I think tutoring can be a positive thing at junior school age; it can shore up work done in class. Know what your goal is when you hire a tutor, finding the right one is crucial. We know tutoring works to improve grades and this impact is not limited to young people from high-income backgrounds either. As more and more young people access private tutors, the gap in attainment between disadvantaged young people and their peers will grow. Our charity uses the power of volunteer tutors to bridge the gap and ensure tutoring support can be accessed by every pupil who needs it, not just those who can afford it. Academic performance is important to Judith. We want our son to get into a good Prep school, and the entrance exams are very competitive. Tutoring will ensure he gets the best chance to go to the school of our choice. Vicki Angel is a fully qualified dyslexia assessor with over 20 years educational experience. Moyles Court (from age 3 to 16yrs) is set within the most beautiful New Forest Park with extensive grounds, offering your child the most wonderful opportunities to thrive in the outdoors as well and the classroom. Her business, Diverse Thinking, aims to recognise and support children and adults with Specific Learning Difficulties. 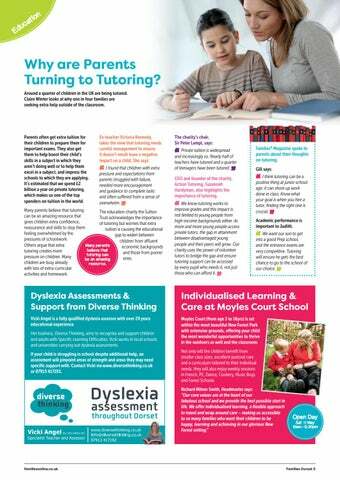 Vicki works in local schools and universities carrying out dyslexia assessments. If your child is struggling in school despite additional help, an assessment will pinpoint areas of strength and areas they may need specific support with. Contact Vicki via www.diversethinking.co.uk or 07913 417192. If you want to host a party at home, think about hiring a company to help. A pizza making party is always winner. You can go to your favourite pizza restaurant or hold a DIY party at home. Cupcake decorating parties also go down well and the guests can take home the tasty treat instead of a party bag. You could also serve food that has a surprise element to it; a cake that is full of sweets when you cut it or ice cream cones filled with savoury fillings. You could also mix up healthy food with treats, such as marshmallows and fruit kebabs or tortilla chips with hummus and crudités. You can even get specialists to come in and set up a sleepover these days. They will put up tents in your garden or your home, and some even supply breakfast on a tray! Or host a science party where someone comes in to do experiments and make goo with the children. They’ll even clean up afterwards. There are also gaming party providers who bring all the entertainment to you. Number cakes decorated with fruit, meringues, and flowers are also all the rage. They make a great centrepiece on a party table. If you prefer a more traditional party, why not hire an entertainer like a magician or clown? Art Parties Themed Parties Magical forest and flower-themed parties are great fun to host if you like being creative. You can also do a whole variety of different activities at your local leisure centre. They often offer a variety of swimming, inflatable and sports parties. Why not pick a sport your child loves? A perennial favourite is also a superhero party. It ticks a lot of boxes and offers great fancy dress options for boys and girls. There are also loads of great decorations you can make, or buy if you don’t have the time! Another popular party is a Harry Potter party. You can make up lots of magical games to recreate a mini Hogwarts at home. You could also check out your local trampoline park to see what party packages they offer. Other easy activity parties include paintballing, bowling, laser quest and go-karting. You could also try something a bit different like a Mexican themed party. Decorate the house with cacti, serve guacamole and dips, hit a Piñata and have plenty of themed games. Kids love food, so why not theme your party around it? According to Pinterest searches for scavenger parties are up by 302%. These are similar to treasure hunts and start with a list of things to find (or do) and a time limit. But there is no set path as players scavenge around and search for all of the items on the list. The player or team who finds everything on the list first or finds the most items before the time is up wins. These parties can be great fun and relatively inexpensive - you could hold one in your garden or a local park or wood. Planning your child’s birthday can involve deep-breathing and military-style planning. This annual event has kids jumping for joy but many parents breaking out into a cold sweat. Claire Winter takes a look at some different party ideas to inspire you. If your child loves making things, an arts and crafts party is the perfect choice for them. You can go to pottery centres, art studios or get a party provider to come to your house to host a craft party. You can do a huge variety of things like mosaics, pottery, painting and jewellery making. Your potential Picassos will also get to take their masterpiece home instead of a party bag. not to stress too much! Your child will remember your efforts whether you hire a circus performer and a bouncy castle; host a fun party at home or organise a trip out the cinema or a trampoline park. Enjoy it and embrace the mayhem; they grow up quickly! Creative Kids’ Parties at the Cove For a fun party experience that indulges your child’s creative-side, book a craft-making party at Create at the Cove. This charming arts & crafts Lulworth-based venue is the perfect place for children to enjoy Pottery Painting, Decopatch or even Make Your Own Cuddly Toy! 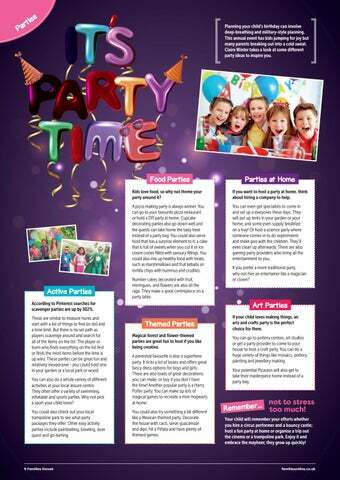 Every party is a special and exclusive occasion and can comfortably accommodate 4 - 10 children at just £10 per child. Refreshments can be arranged and you can bring your own party bags. Relax in the coffee lounge while the party is in full-swing, and you can always end a wonderful day with a visit to Lulworth cove, just a 5 minute stroll away! Mayim Mermaid Academy is the UK's longest running academy of its kind, providing Mermaid group, 1:1 or 2:1 lessons and bespoke Mermaid Parties for up to six children aged 8+. You can also hire a host Mermaid for that special occasion or enjoy a Mermaid photo shoot. Celebrate your little one’s special day at Oasis Fun. With bowling, soft play, arcades, adventure golf, and a diner/bar, there’s plenty to do and enjoy. You can create a unique event that everyone will love and that provides hours of fun. Safety is our main priority and our fins and tails are the best in the industry. All group sessions are for children aged eight or over, while 1:1 and 2:1 lessons are available from six years, subject to passing the swimming ability criteria. Oasis Fun parties include an hour of activity, an hour in the party room and a buffet menu that includes sandwiches, pizza, chicken goujons and fruit salad, all for just £16 per child. Book your party today on 01202 311611 and let the fun begin. For full details, visit www. mayimmermaidacademy.co.uk or see our Facebook page @mayimmermaidacademy. Whatever your party occasion, Oasis Fun has something for everyone. Create a truly unique event for hours of party fun. Get in touch today and let the fun begin! How Safe Will Your Child Be? 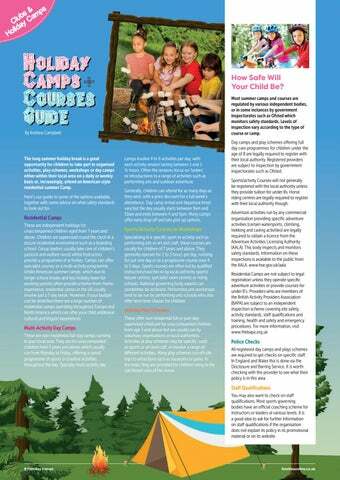 Most summer camps and courses are regulated by various independent bodies, or in some instances by government inspectorates such as Ofsted which monitors safety standards. Levels of inspection vary according to the type of course or camp. The long summer holiday break is a great opportunity for children to take part in organised activities, play schemes, workshops or day camps either within their local area on a daily or weekly basis or, increasingly, attend an American-style residential summer Camp. Here’s our guide to some of the options available, together with some advice on what safety standards to look out for. Residential Camps These are independent holidays for unaccompanied children aged from 7 years and above. Children are supervised round the clock in a secure residential environment such as a boarding school. Group leaders usually take care of children’s pastoral and welfare needs whilst Instructors provide a programme of activities. Camps can offer specialist courses or a multi-activity programme. Unlike American summer camps, which due to longer school breaks and less holiday leave for working parents often provide a home-from-home experience, residential camps in the UK usually involve just a 7 day break. However, if your budget can be stretched there are a large number of residential camps operating throughout Europe and North America which can offer your child additional cultural and linguist experiences. camps involve 4 to 6 activities per day, with each activity session lasting between 1 and 1 ½ hours. Often the sessions focus on ‘tasters’ or introductions to a range of activities such as performing arts and outdoor adventure. Generally, children can attend for as many days as they wish, with a price discount for a full week’s attendance. Day camp arrival and departure times vary but the day usually starts between 9am and 10am and ends between 4 and 5pm. Many camps offer early drop off and late pick up options. Sports/Activity Courses or Workshops Specialising in a specific sport or activity such as performing arts or art and craft, these courses are usually for children of 7 years and above. They generally operate for 2 to 3 hours per day, running for just one day or as a progressive course over 4 to 5 days. Sports courses are often led by qualified instructors/coaches or by local authority sports/ leisure centres, specialist swim centres or riding schools. National governing body awards can sometimes be achieved. Performing arts workshops tend to be run by performing arts schools who also offer term time classes for children. Holiday Play Schemes These offer non-residential full or part-day supervised childcare for unaccompanied children from age 3 and above but are usually run by voluntary organisations or local authorities. Activities at play schemes may be specific, such as sports or art and craft, or involve a range of different activities. Many play schemes run off-site trips to attractions such as museums or parks. In the main, they are provided for children living in the catchment area of the venue. Police Checks All registered day camps and plays schemes are required to get checks on specific staff. In England and Wales this is done via the Disclosure and Barring Service. It is worth checking with the provider to see what their policy is in this area. Staff Qualifications You may also want to check on staff qualifications. Most sports governing bodies have an official coaching scheme for instructors or leaders at various levels. It is a good idea to ask for further information on staff qualifications if the organisation does not explain its policy in its promotional material or on its website. Play, The Way Nature Intended Pouncing Panthers provides a multi-activity holiday club for children aged five to twelve. Families Dorset caught up with Co-Founder, Victoria Pimm, to find out more. Cycle Safety Courses for Kids Bikeability is about giving people the skills to cycle on today’s roads. Level 1 and 2 Course: Level 1 teaches trainees to control and master a bike in a playground area, developing basic cycle control skills. Level 2 equips trainees with the skills to cycle on local roads, developing safe cycling skills and understanding of the road and traffic environment. Level 3 Course: Level 3 is for children who have successfully completed Level 2 and are an experienced, confident cyclist. It provides the skills to tackle a wide variety of traffic conditions, many different road layouts and challenging traffic scenarios. Find out more about BCP Council’s Saturday sessions & holiday courses, visit bcpcouncil.gov.uk/bikeability or call 01202 454636 to book. So Victoria, what inspired you to launch Pouncing Panthers? Technology is encouraging a sedentary lifestyle, and it’s important to get children outside, get them fit and active and encourage healthy habits from a young age. My husband, Justin, & I set up the club at the Mudeford Wood Community Centre in Christchurch in 2016. As parents ourselves, we wanted our children to experience as many different skills as possible whilst still ultimately having fun, thus Pouncing Panthers was born. Our motto ‘Play, the way nature intended’ is at the centre of everything we do, and the children love it! What activities can children get involved in? We offer several sports including but not limited to tennis, football, hockey and dodge ball and also other skills such as martial arts and street dance. These physical activities are interspersed with the more relaxing yoga, arts and crafts and oral Spanish and French…very useful for that family holiday! We also take the children into the woods for nature walks and den building and also down to the beach for sand art and beach volley ball. Not only do our children learn invaluable skills but they also gain from making new friends, building confidence and making wonderful memories. What’s there not to love? What’s new at Pouncing Panthers? We recently launched our holiday club at Durlston Court School in New Milton, working within their stunning grounds and using their incredible facilities. The club was really well-received, and we’re looking to offer more days over the summer holidays! Check our social media page @PouncingPanthers - for new dates and how to book. We’ve also appointed new front-of-house Managers, Stevie and Carly, who bring over 10 years’ experience working with children, including those with learning difficulties. They are both trained actors too so they’re sure to bring some extra ‘pazzazz’ to our clubs! Discover more about Pouncing Panthers at www.pouncingpanthers.com or call 01202 250617. All Day: £28 (9am-4pm) Half Day: £18 (9am-12pm or 1pm-4pm) Early Bird: £7 (Extra 30mins) Visit pouncingpanthers.com for more info, dates and timetable or call 01202 250 617. Help your Children Make Friends Linda Blair’s Top Tips for Parents 55% of parents say they are anxious about making new adult friends and it’s therefore not surprising that some children are also not sure how to go about this. It’s useful to help them understand that the easiest way to make a friend is to BE a friend. Psychologist Linda Blair has some useful tips for children and parents. Tips for Children Offer to Help If you think another child isn’t sure about whether to join in with what you’re doing, invite them to do just that. Everyone likes to feel included. Sharing is Caring When you’re with your friends, offer to share your toys, so you can all play together. Taking Turns Make sure everyone you’re with gets to have a turn at whatever you’re all doing. They’ll know that you are a kind person. Talk about them afterwards. Start reading these stories as early as possible, even before you think your child can understand them! Whenever you see an opportunity, ask your child how a character could be feeling - and ask how they know. Some children may want a parent’s help to start a conversation. Working with your child to think of a few things they can say like “I like your lunch box” or “What games do you like?” can help your child feel more comfortable about starting to talk to a potential new friend. Joining In Encourage your child to watch what other children are playing and think about what they can do to fit in. Suggest they try joining the game by doing something that’s relevant to it e.g. if children are playing at running a library, volunteer to be somebody who wants to borrow a book. Make a Head Start Before your child starts a new school year, find out if you can who else will be in their class. Then invite one of those children over to play with your child during the summer holidays. That way, once school starts, your child already has a friend from the start of term. This in turn will reduce their anxiety when they go into class on that first day. Stress that it’s important not to be negative about the game or try to change it and if the others don’t want them to join in right then, to try again another day. Do as I Do During the early years, parents are their child’s best role models. Try to show your children how to make friends by setting a good example - giving the people around you your full attention and listening fully whenever your child, your partner or other key people around you want to tell you something. Show you’re concerned about how other people are feeling and thank others when they do things you appreciate. discount Voucher: One child free with a paying adult! One Voucher per group per visit. Not to be used in conjunction with any other offers. Free Annual Entry When You Adopt a Primate Monkey World is a truly unique place. It’s home to four large family groups of chimpanzees living naturally outside of Africa, Europe's only orangutan crèche, and an active breeding population of endangered woolly monkeys. Already this year, the centre has welcomed an orphaned infant to the orangutan group, and births in the rare white-throated guenons group, the world’s only breeding population of woolly monkeys and the little-studied endangered Bengal slow loris group. Combining fun with conservation, you can discover more about man’s closest living relative with half-hourly keeper talks, then ‘monkey around’ in the south’s largest Great Ape playground. Camp Bestival Camp Bestival is known as the UK’s ultimate family festival, having won Best Family Festival at the UK Festival Awards five times. Taking place 25th-28th July at Lulworth Castle, the four-day festi-holiday offers hundreds of things to see and do. From headliners Nile Rodgers & CHIC, Jess Glynne and Annie Mac, family fun with Mr Tumble, Mister Maker and Shaun The Sheep, to science shows and circus workshops, there’s so much for kids of all ages to enjoy. Tree-climbing, woodland workshops, helter skelters, giant bubble workshops and face painting for the kids through to teens having poetry slams, teen only spinning classes, sleeping out under the stars and How To… workshops, there really is something for everyone. Parents are particularly spoilt at Camp Bestival; well, they do buy the tickets! Amazing live acts and DJs, raves, discos, parties, comedy, literary talks, parenting advice and stories, cocktails, awardwinning street food, likeminded people all in a big old field by a castle and the sea. Feel The Magic of Vintage Train Travel Swanage Railway is the picture postcard branch line to the seaside. Steam trains run for six miles, weaving their way through the beautiful Purbeck countryside from Norden, home of the Purbeck Mineral Mining Museum, past the magnificent ruins of Corfe Castle to the sandy beach of Swanage, the eastern gateway to the Jurassic Coast, a World Heritage site. Swanage Railway offers an intensive heritage steam train service with departures up to every 40 minutes in the summer season. Special events, including steam galas in the Spring and Autumn, a diesel gala in May and our acclaimed Santa Specials in December, run each year. Get Closer to Nature at Kingston Maurward Head down to this celebrated, familyfriendly Animal Park in the heart of Dorset. With lots of animals to meet including peacocks, birds of prey and wallabies; you can even feed the goats and sheep, enjoy a picnic, or visit the park café. Take a walk along the lakeside nature trail and explore the stunning formal gardens and parkland. Kids’ activities run throughout all school holidays with discounts for locals. Fun for all the family - the perfect day out! PLUS: brand new indoor play barn for those wet days coming soon! Enjoy the Fun of the Fair at Baiter Park Poole Dorset’s favourite family fairground is returning to Poole’s Baiter Park this spring! Enjoy amazing value for money with our £6.99 wristband which provides you with unlimited rides for two hours! The line-up includes all of the family favourites such as the Dodgems, Waltzer, Sizzler, children’s rides and bouncy castles. Opening 25th May until 1st June, the sessions are 12-2pm, 2-4pm, 4-6pm and 6-8pm. Come along and enjoy the fun! WANT TO PROMOTE YOUR LOCAL EVENT IN THE NEXT ISSUE? For more information visit www.visitkm.co.uk or call 01305 215003. Find us on Facebook - William Cole & Son Amusements. Make Memories at Old Bidlake Farm Special moments shared with family form our fondest childhood memories, yet for many parents it is more difficult than ever to find time for those valuable opportunities. There’s also a wide range of educational activities for schools & colleges as well as corporate hospitality, public events and private function hire all year round. for 20% off all off-peak stays. A camping adventure under the stars offers the perfect escape for all the family, a million miles away from everyday life. To make the most of precious family time Old Bidlake Farm has everything you need ready and waiting for your arrival, with beautifully furnished Bell Tents and a thoughtfully-equipped facilities barn, so you can just pitch up and start making magical memories. Discover more at www.oldbidlakefarm.co.uk. is haunted. Enjoy the stunning and far reaching views of the Jurassic Coast from the picnic areas on the Ramparts, which provide one of the best vantage points on the south coast. Once Upon A Princess Tivoli Theatre, Wimborne BH21 1LT The ultimate pop Princess party, live on stage! This glittering production features your favourite fairytale Princesses and a soundtrack of top pop hits and movie musical classics. 12pm & 4pm. £12. Experience the breath-taking dynamics of bubbles, combining comedy and artistry with audience participation and spellbinding bubble tricks. 11am & 2.30pm. Adult £12, child £10 advance. Take a dive into the deep as a Jawsome Ranger and fulfil the mission of finding the missing shark teeth. Help Professor Finn locate the large Play-Doh model shark teeth in the tanks. Once qualified, Jawsome Rangers get a special Play-Doh gift. Get creative at this charming and unique all-weather venue. Choose from a variety of craft kits, fossil digging, model making, decopatch, paint your own pottery, colouring & painting, make your own cuddly toy and more. Open daily from 10am–5pm. Up Close & Personal with Birds of Prey Liberty’s Owl, Raptor & Reptile Centre, Ringwood BH24 3DZ A fun, thrilling and educational family day. Liberty’s houses a large collection of birds of prey and an indoor reptile house. Observe these magnificent birds flying free or experience falconry first-hand with our Flying Experience Days. 10am–5pm. 4, 11, 18, 28-29, 30-31 May, 8, 15, 22, 29 June Bikeability Level 1 & 2 Courses King’s Park Cycle Centre, Bournemouth BH7 7AF Give your child the skills to cycle on today’s roads. Level 1 & 2 cycle training for children aged 10 and over to help build the skills and confidence to ride a bike safely on the road. Saturdays & May Half Term from 9am–12.30pm & 1–4.30pm. Visit bcpcouncil.gov.uk/bikeability or call 01202 454636 to book. 4–6, 25–27 May Go Nuts! Monkey World, Wareham BH20 6HH Every child who brings an unopened bag of nuts for the primates receives a free Monkey World badge over the Bank Holiday weekend. 10am–5pm. Adult £14, child £10, under 3s free. 5 May Knob Fest Kingston Maurwood College, Dorchester DT2 8PX Visit the world-famous Dorset Knob Throwing Festival. Fun attractions include fun Knob Eating, Knob Painting, a Knob & Spoon Race, Knob Darts and a Knob Pyramid. A fun family day out with a difference! 10am–4pm. Adult £5, child <12 free. 6 May, 3 June Wildlife Tots Blashford Lakes Nature Reserve, Ringwood BH24 3PJ Fun outdoor play and wildlife discovery activities for the family. For age 2–5. 10.30am–12pm & 1–2.30pm. Booking essential. Dash through the 50ft obstacle course. Get unlimited use of nine activities for you and your family to enjoy. Why not compete against the kids? Suitable age 5+. 10am–4.30pm. Advance booking. £9.99. 21 May – 13 June Matchstick Fleet Exhibition Nothe Fort, Weymouth DT4 8UF Made entirely of matchsticks and matchboxes, marvel at a special exhibition of model ships, that have taken one man a lifetime to build. Be amazed at the detail and accuracy of the modern warships models on display. 10.30am–5.30pm. Swanage Railway’s Diesel Gala and Dorset Beer Festival runs an intensive daily service over the full 10 mile line between Swanage and Wareham. 1 Day Rover tickets on the day: Adult £35, child £25, family £73. Discounts on advance bookings. 11 May Sooty’s Magic Show The Regent Centre, Christchurch BH23 1AS Izzy Wizzy let’s get busy! Join Sooty for his brand-new Laugh Out Loud Magic Show! A spectacular family treat with a chance to meet Richard and Sooty after the show! 11am & 2.30pm. Adult £12.50, child £10.50, family £40. Spring Country Fayre High Mead Farm, Ferndown BH22 9DR There’s something for all the family to enjoy with children’s play area, small animal cuddle corner, alpaca walks, fun dog show, birds of prey, storytelling and country fayre games. 10am–7pm. Adult £5, child £3, under 3s free. 12 May Lone Parent Fair St James Church, Poole BH15 1JN Come and join in the fun. With haircuts, manicures and beauty treatments (parents only), bike safety checks, legal advice, budget coaching and parenting advice. Children can also enjoy face painting, entertainment, games, crafts and more. 10am–1pm. Free. There’ll be much raiding, pillaging and plundering with pirate stalls, food, re-enactments and entertainment for all ages. 10am–4pm. 25 – 26 May 1940’s Home Front Family Weekend Nothe Fort, Weymouth DT4 8UF What was life like during WW2? 1940’s war time history is brought to life with Home Front re-enactments, or try the Evacuee Experience and visit secret areas of the fort. Plus 1940’s vehicle displays, live entertainment, themed activities, side shows and stalls. 10.30am–5.30pm. Adult £8, child £2, family £18, under 5s free. 25 – 27 May Inflatable Theme Park Redland Community Sports Hub, Weymouth DT3 5BA Experience some of the best bouncy castles and slides in Dorset. Children receive unlimited access to 10 large inflatables, a visit from Mickey and Minnie Mouse and a free face paint. There’s also an under 5’s inflatable area. 10am–12pm, 12.30–2.30pm, 3–5pm. Adult free, child £6. 25 May – 1 June Family Fairground Baiter Park, Poole BH15 1TQ Dorset’s favourite family fairground is returning to Baiter Park. Enjoy amazing value for money with a £6.99 wristband for unlimited rides on all the family favourites for two hours! 12–2pm, 2–4pm, 4–6pm and 6–8pm. Come along and enjoy the fun! 25 May – 2 June 50 Things This May Half Term Kingston Lacy House & Gardens, Wimborne BH21 4EA Have some wild fun over May half-term. Explore the woods and parkland on the Woodland Walk, have a go at some of the 50 Things to do before you’re 11¾ and celebrate birds, bugs and bees with some hands-on activities. 10am – 4pm. Admission charges may apply. May Half Term on Brownsea Island Brownsea Island, Poole BH13 7EE Get your children out and about and enjoying nature on Brownsea Island. Grab a free adventure trail or join a special free Minibeast guided adventure, and more to discover the island’s weird and wonderful wildlife. 10am–5pm. Normal admission fees apply. May Half Term at Kingston Maurward Kingston Maurward Animal Park & Gardens, Dorchester DT2 8PX Go wild at Kingston Maurward this half term! Explore the stunning parkland estate, discover our friendly farmyard animals, and enjoy a range of kids’ activities. 10am–5pm. Adult £7, child 4-16 £5, child age 3 £2, under 2s free. Treasure Trail Avon Heath Country Park, Ringwood BH24 2DH Your treasure awaits you, but first you must embark on an adventure across the heath and through the woods in search of clues to unravel the wildlife riddles for your prize at the end. 11am–3pm. £3. 26 May West Bay Pirate Day West Bay, Bridport DT6 4HA Shiver me timbers! There’s pirate mayhem at West Bay harbour with pirate games and entertainment for all the family. 12–5pm. Free. 27, 29 May Creepy Crawly Show Upton Country Park, Poole BH17 7BJ Mad 4 Animals returns with their energetic Creepy Crawly Show introducing some exotic animals while encouraging participation. 9.45–11.30am. Child £2.50. Adults & under 2s free. Highcliffe Castle, Christchurch BH23 4LE Follow the Pirate trail around the inside of the castle, with crafts and activities in the Dining Room. 10am–3.30pm. £2.50. Come and try out this Olympic Sport and learn all the moves and routines to make you into a top trampolinist! Socks must be worn. Age 5–12. 10–11.30am. £5.40. With a learning through laughter approach, you will have a great time meeting some incredible animals, no doubt with a few screams along the way! With meet & greet after the show. 10.30am–12pm, 1.30–3pm, 5.30–7pm. £5. A fun-packed day in which your child will enjoy a multitude of sports such as hockey, football, tag rugby, dodgeball, swimming and more. Age 5–13. 8.45am–4pm. £19.50 day. 28 – 30 May Fun First Club QE Leisure Centre, Wimborne BH21 4DT A daily programme of sporting activities and creative arts and crafts for children aged 5-13. 8.45am–4pm. £19.50 day. 28 May – 2 June Medieval Mayhem with Fiery Jack Corfe Castle, Wareham BH20 5EZ Celebrate May madness at the castle with Fiery Jack and the medieval jester academy. Experience new and different activities during the week to entertain the fools in your family as Fiery Jack and friends hold court. 10am–5pm. Free events. Admission charges apply. 29 May Pop Up Pottery Avon Heath Country Park, Ringwood BH24 2DH Sculpt, create and decorate your own spring time decorations from air dry clay. Suits age 4+. 11am & 1.30pm. Booking essential. £8. 29 – 30 May Bounce, Bend & Boogie Two Riversmeet Leisure Centre, Christchurch BH23 1HW A great day to enjoy gymnastic activities, trampolining, swimming and dancing. It’s enough to tire even the liveliest children! Age 5–13. 8.45am–4pm. £19.50 day. Wild Days Out: Wild in the Woods Blashford Lakes Nature Reserve, Ringwood BH24 3PJ Outdoor fun in the woods cooking up wild treats over the campfire and building dens! 10am–3pm. £21. Universarama! Corn Exchange, Dorchester DT1 1HF Using only silly puppets, ridiculous props and assorted fruits and vegetables, you’ll learn the secrets of the universe! A blend of spectacle, storytelling and cabaret making an accessible, funny and unique family show. 2pm. Adult £8, child £6, family £25. Unlimited soft play with two new bouncy inflatables for children aged 1–5. 9am–12pm. £3.80. Wildlife Detectives Avon Heath Country Park, Ringwood BH24 2DH Put on your detective hats, look for animal tracks, trails and signs and maybe meet a mammal. Suitable age 5+. 9–10.30am. Booking essential. £3. 1 June Eco Crabbing Fine Foundation Wild Seas Centre, Kimmeridge BH20 5PE Find out how to catch seashore crabs without harming them or the other marine life that lives with them, and learn how to look after your catch. 1.30–3pm. £5. Spring Arts Fest Kings Park, Bournemouth BH7 6JD With live entertainment, mascot appearances including Paw Patrol’s Marshall, mini funfair and more. 12–7pm. Free entry. Donations to Amelia’s Rainbow charity. 6 – 7 June Much Ado About Nothing Highcliffe Castle, Christchurch BH23 4LE The sparring antics of Shakespeare’s erstwhile lovers, Beatrice and Benedick, provide great hilarity for the other members of the household who plot to reunite them. A delicious comedy treat for all the family. 7pm. Adult £13.50, child £5, family £44. 7 June Fathers’ Day Mini Makes & Bakes Lollipops Play Café, Bournemouth BH4 9EH Make memories with your child with 30-minute sessions of biscuit making and card and gift making for Father’s Day. For 2-5 years. £7.50 hour. The only UK show which celebrates cheese and chilli within a family festival setting. With stalls, competitions, live demonstrations and music plus a children’s play zone including Punch and Judy, magician, circus skills, crazy golf, human sized table football, children fun rides and inflatables. 10am – 5pm. Adult £8/£6 advance, child under 16 free. A fun family day on the farm. Say hello to goats, pigs, lambs and calves and enjoy children’s activities including butter and cheese-making, cupcake decorating and welly-wanging. Free goody bag to the first 50 children. 11am–3pm. Free entry. Donations welcome. Shakespeare’s most enduringly popular comedy of love and intrigue, magic and mayhem, is brought to life in this wonderfully funny and exuberant Shakespeare classic. Come and be enchanted too by this exciting and intriguing family production. 7pm. Adult £13.50, child £5, family £37. 15 June Family River Dip Blashford Lakes Nature Reserve, Ringwood BH24 3PJ Pull on your wellies for a splash in the Dockens Water river in search of fish. 10–11.30am. £4pp. Happy’s Circus St Mark’s School, Bournemouth BH10 4JA This amazing show features acrobats, aerialists, magic, speciality acts, clowns, audience participation and more! Plus stalls and games. Gates 12pm. Starts 2pm. Ticket £10, family £37. Harry Paye Pirate Day Poole Quay BH15 1HA Poole celebrates its famous pirate son Harry Paye with a day of pirate themed family fun and entertainment. The event kicks off with the Parade of Pirates followed by muskets and cannon displays. 12–6pm. Free. 16 June Father’s Day Farmer Palmer’s Farm Park, Poole BH16 6EU Monkey World, Wareham BH20 6HH Treat dad to a fun family day out! Dads get free entry to Farmer Palmer’s and 50% off entry at Monkey World with valid vouchers from the venues’ websites. Kingston Maurward Summer Open Day Kingston Maurward College, Dorchester DT2 8PY The perfect day out for all the family. Enjoy live music, birds of prey, pony rides, tractor driving and dog shows, buy local produce, watch demonstrations or head down to the animal park for bouncy castle, soft play and even Guinea pig fishing! 10am–5pm. Free entry. 28 – 30 June Dorset Moon feat. Museum of the Moon Bournemouth Central Gardens, Bournemouth BH2 6DY Bournemouth’s exciting new summer arts event features Luke Jerram’s internationally acclaimed Museum of the Moon – a 7m diameter spherical sculpture that’s a fusion of NASA lunar imagery, moonlight and surround sound. Free. 29 June Weldmar Family Dog Show Joseph Weld Hospice, Dorchester DT1 2SL This annual dog show is great fun for the family and your furry friends. Enter your pooch for £1 and enjoy stalls, food and more. Proceeds to Weldmar Hospice Care. 11am–4pm. Under 3’s free. Detective Pikachu (PG) Verwood Hub, Verwood BH31 7QE In a world where people collect Pokémon to do battle, a boy comes across an intelligent talking Pikachu who seeks to be a detective. 1pm & 4pm. Rockley Watersports are offering free taster sessions in kayaking, sailing, and stand up paddleboarding (SUP). From 12.30pm Saturday & from 10am Sunday. Free. DON’T FORGET to check with the venue before setting off just in case anything’s changed since we went to print. And remember to tell them you heard it first in Families Dorset magazine! A great value day out for the whole family! 55% of parents say they are anxious about making new adult friends and it’s therefore not surprising that some children are also not sure how to go about this. It’s useful to help them understand that the easiest way to make a friend is to BE a friend. Psychologist Linda Blair has some useful tips for children and parents. The long summer holiday break is a great opportunity for children to take part in organised activities, play schemes, workshops or day camps either within their local area on a daily or weekly basis or, increasingly, attend an American-style residential summer Camp. Why are Parents Turning to Tutoring? Around a quarter of children in the UK are being tutored. Claire Winter looks at why one in four families are seeking extra help outside of the classroom. Last year, Families Magazine conducted a nationwide survey asking readers to tell us what they find useful about our magazine.